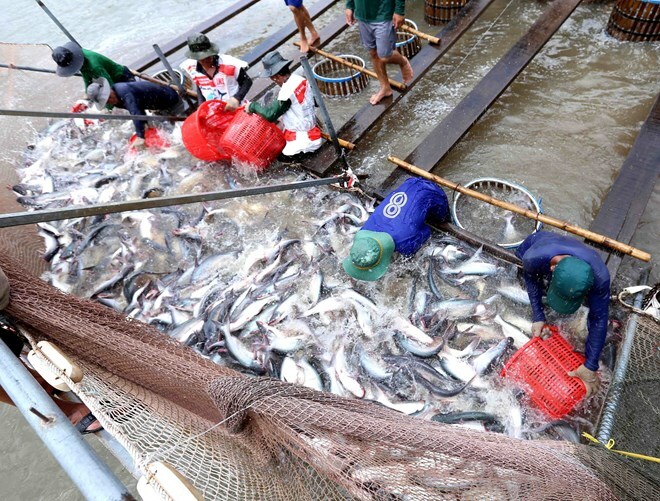 HCM City (VNA) – Vietnam’s tra fish (pangasius) industry has been urged to strongly improve its quality so as to compete with not only traditional rivals, but also its biggest tra fish importer – China. According to the Vietnam Association of Seafood Exporters and Producers (VASEP), the domestic tra fish sector faces many rivals, including India, Indonesia, and Bangladesh – who each represents around 15-20 percent of global production. The global production of farmed tra fish was estimated at 2.8 million tonnes in 2018, up 6 percent from the previous year, and about 45 percent of this total was sourced from Vietnam, mostly in the Mekong Delta. As of March 2019, there were 20 tra fish processing factories in China whose production capacity had reached some 30,000 tonnes per year. This fact indicates that China is likely to become a big rival to Vietnam’s tra fish industry in the near future, VASEP said. However, insiders said the competitiveness of Vietnamese tra fish should not be assessed through only quantity, but the quality of fish fry and products is the key. To help address this issue, a high-tech tra fish farming project covering 600 ha will be carried out in the Mekong Delta province of An Giang in the fourth quarter of this year. When operational, it is expected to supply around 200,000 tonnes of high-quality raw materials each year for processing and subsequent export. VASEP Secretary General Truong Dinh Hoe said once the quality of Vietnamese tra fish is improved and wins the trust of consumers in demanding markets, it will also have more opportunities to be sold well on the e-commerce platform of Alibaba of China, as well as on Amazon of the US. “Through the e-commerce website (Alibaba), Vietnam’s tra fish products will have greater chances to enter this giant market,” he added.